The Monastic Macrina, Sister of Sainted-Hierarchs Basil the Great and Gregory of Nyssa, was born in Cappadocia at the beginning of the IV Century. Her mother, Emilia, saw in a dream an Angel, naming her yet unborn one Thekla, in honour of the holy First-Martyress Thekla. Saint Emilia (Emily, Comm. 1 January) fulfilled the will of God and named her daughter Thekla. Another daughter that was born they named Macrina, in honour of a grandmother, who suffered during the time of persecution against Christians under the emperor Maximian Galerius. Besides Macrina, in her family were nine other children. Saint Emila herself guided the upbringing and education of her elder daughter. She taught her reading and writing in the Scriptural books and Psalms of David, selecting those examples from the Sacred books, which instructed of a pious and God-pleasing life. Saint Emilia trained her daughter to attend church services and make private prayers. Macrina was likewise taught the proper knowledge of domestic governance and various handicrafts. She was never left idle and did not participate in childish games or amusements. When Macrina grew up, her parents betrothed her to a certain pious youth, but the bridegroom soon died. 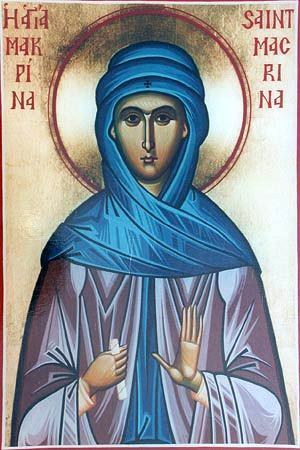 Many young men sought marriage with her, but Macrina refused them all, having chosen the life of a virgin and not wanting to be unfaithful to the memory of her dead fiancee. The Monastic Macrina lived in the home of her parents, helping them fulfill the household tasks as an overseer together with the servants, and she carefully followed after the upbringing of her younger brothers and sisters. After the death of her father she became the chief support for the family. When all the children grew up and left the parental home, Saint Macrina convinced her mother, Saint Emilia, to leave the world, to set their slaves free, and to settle in a women's monastery. Several of their servants followed their example. Having taken monastic vows, they lived together as one family, they prayed together, they worked together, they possessed everything in common, and in this manner of life nothing distinguished one from another. After the death of her mother, Saint Macrina guided the sisters of the monastery. She enjoyed the deep respect of all who knew her. Strictness towards herself and temperance in everything were characteristic of the saint over the course of all her life. She slept on boards and had no possessions. Saint Macrina was granted a gift of wonderworking. There was an instance (told by the sisters of the monastery to Saint Gregory of Nyssa after the death of Saint Macrina), when she healed a girl of an eye-affliction. Through the prayers of the saint, at her monastery in times of famine there was no shortage of wheat, necessary for the use of the sisters. Saint Macrina died in the year 380, after a final sigh of exalting prayers of thanks to the Lord for having received of Him blessings over all the course of her life. She was buried in the same grave with her parents.